Make a strong statement of class with antique design tub positioned centrally in your bathroom. 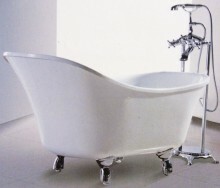 Give your bathroom a touch of a palace look with our range of claw foot bathtub. This special design bathtub comes with a complete set free standing shower system that brings not just optimum comfort to you but also class to your bathroom. Click the button below to add the Claw-Foot Freestanding Tub to your wish list.